Are painted walls on your cleaning list? 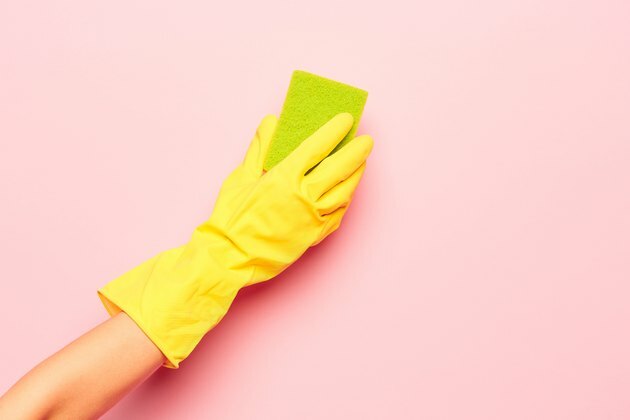 Whether you just want to freshen up the walls or they have stains, dirt or grime that needs to come off, finding the best way to wash walls without streaks can be challenging. Using a gentle cleaner option and taking care with your cleaning can help minimize streaking or marks left behind. Cleaning painted walls can cause streaking for a number of reasons, including the dirt and grime that's already there. When you mix water with those deposits, they can stick to the wall even more and leave behind streaks. Using too much water or using a harsh cleaner can also cause streaks, especially if you let the liquid drip down the wall. Scrubbing too hard, especially on flat finishes, can wipe away some of the paint and cause a streaky look. Not all paint types respond as well to cleaning as others. In general, higher-gloss finishes can handle cleaning better without showing streaks or coming off the wall. If you have walls with flat, satin or eggshell finishes, you may have a harder time cleaning them. Rubbing too hard can wipe away the paint. Oil-based paint tends to hold up better than latex paint while cleaning. Some latex paint is also designed to be washable and may handle cleaning better than regular latex paint. You may even be able to use a mild degreaser product on these types of paint, but you should always test the product in a hidden area. If you're doing a general cleaning without any stains to tackle, plain water may be enough to do the job. For stains, fingerprints or other visible marks, you may need to step it up a little. Always move from gentle to stronger to cut down on the chances of streaking and paint damage. A little dish detergent mixed with warm water is a gentle option. You can also use vinegar mixed with water. If that's not enough, start with a gallon of warm water and add 1/2 cup of vinegar, 1 cup of ammonia and 1/4 cup of baking soda. No matter which option you choose, always test the wall-cleaning solution in a hidden area before you start washing. This lets you see if the cleaner will affect the look of the paint or leave behind any marks. Once you know it's safe to use, you can move on to the rest of the walls. Start by removing dust and loose dirt from your walls. You can do this by using a lamb's wool duster or your vacuum cleaner fitted with a bristle-brush attachment. The best way to clean walls is to start at the ceiling and work your way down so you don't redeposit the dust on other parts of the wall. It's a good idea to put some towels at the base of the wall where you're cleaning in case any of the solution drips. The towels catch the water to prevent it from damaging the baseboards or the floor. Use a soft sponge without dyes in it to clean the walls. Dip the sponge into the water and wring it out. Flat, satin and eggshell finishes in particular do best with as little water as possible, so squeeze out the water well. On glossy walls, you can get away with using a little more water. Starting at the top of the wall and working toward the floor helps you catch drips if they happen. If you start at the bottom, a stray drip from above can cause streaks on the already-cleaned sections. Rinse the sponge regularly so you don't move grime around onto other parts of the wall and cause more streaks. Use a gentle, circular motion to protect the painted surface. If you have a stubborn stain that doesn't come off with the wall-cleaning solution, you can make a paste using baking soda and water. Test your paste on an inconspicuous spot and let it dry to make sure it doesn't leave any water marks or other damage. If the test comes out fine, you can move on to other areas of the wall. Use a sponge to gently work the paste into the stain using a circular motion. Follow up with a fresh sponge that's just dampened with water to wipe away the paste. After cleaning, dry the areas with a clean towel to prevent water marks that can make the wall look streaky.